Udaipur District Junior Technical Assistant Jobs Recruitment 2017: Office of the District Programme Coordinator, Udaipur, Rajasthan invites application forms from suitable/ eligible candidates for total 129 contractual vacancies. Available vacancies in Udaipur District Recruitment are 97 Junior Technical Assistant posts and 32 Accounts Assistant posts. Interested applicants who meet the required qualifications/ eligibility criteria can apply for these Udaipur District Recruitment jobs. Educational qualifications required for Junior Technical Assistants is Diploma/ B.E/ B. Tech Degree in Civil Engineering/ Agricultural Engineering. Qualifications for Accounts Assistant is Intermediate (IPC/ ICWA/ B.Com/ C.A. Age of the candidates should be between 21 years to 35 years. Age relaxations applicable as per the District Programme Coordinator, Udaipur Organization Norms. For more details of Eligibility criteria, other qualifications, Age criteria details of Udaipur District Recruitment are given below. Interested Jobs Seekers who are willing to apply for these Jobs, are suggested go through the district website www.Udaipur.rajasthan.gov.in. Open the application form for selected post. Read the Udaipur Notification for application procedure details. Complete the procedure of application form and attach requisite documents, recent scanned photographs. Application form for Udaipur Dist jobs can send on or before 06-November-2017. Application form should be addressed to the Office of the District Programme Coordinator MGNREGA and Collector Office, Zilla Parishad, Udaipur before last date. Candidate must write the name of the post on the envelope of application form. Selected individual for the current recruitment vacancies will be paid Rs. 13000/8000/- per month. Application fee for the selected posts in District recruitment is Nil. 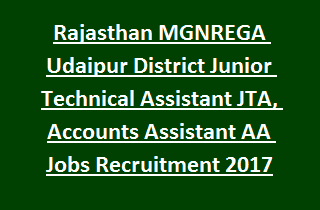 Brief details regarding Udaipur District Recruitment Jr Technical Assistant, Accounts Assistant Jobs Vacancies details, Application Procedure, Application Fee, Salary details please check below given information. Aspirants having eligible qualifications can download the application form from fill the application form www.Udaipur.rajasthan.gov.in. Application fee for Udaipur Dist recruitment is nil. Fill the mandatory details and send the application through post before 06/Nov/2017. Further information of District Programme Coordinator, Udaipur Recruitment are mentioned below. Name of posts: Junior Technical Assistant JTA, Accounts Assistant AA. Total no of vacancies in Udaipur District Recruitment are 129 posts, Post wise details are given below. 1. Junior Technical Assistant: 97 posts. 2. Accounts Assistant: 32 posts. Jr. Technical Assistant Jobs is Rs. 8000/- per month. Accounts Assistant jobs is Rs. 8000/- per month. Qualifications for Jr. Technical Assistants is Diploma/ Degree in Civil Engineering/ Agricultural Engineering from recognized university. Qualifications for Accounts Assistants is Intermediate I.P.C/ I.C.W.A/ B.Com/ C.A from recognized board/ University. Please check the Notification for more qualification information. Candidates must have age limit of 21 years to 35 years as on cut- off date (mentioned in the notification). Age relaxations applicable as per Udaipur district organization norms. Candidates will be selected for Jr. Technical Assistant posts is based on Qualifications, Experience and Computer Knowledge. Interested Job seekers may go through the Udaipur district official website www.Udaipur.rajasthan.gov.in. Click the Notification link of Udaipur District and read the eligible qualities for applying Jr. Technical Assistant vacancies. Go through details of application form and fill all required fields. Upload the necessary documents and other required proofs along with application form. Verify the details before submission of application form. Last date for sending Udaipur application forms is 06/November/2017.